Alexa fans, the day you’ve been waiting for has officially arrived — Amazon’s second-generation Echo Dot has been released. This tiny speaker packs nearly all of the same functionality as Amazon’s $180 Echo speaker, but at a small fraction of the price. 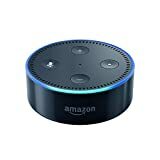 What’s more, Amazon is still offering a killer deal that gets you a free sixth Echo Dot speaker when you order five. If you’re planning on packing your home with Dots so you have hands-free access to Alexa wherever you go, this is the deal for you. Just used the coupon code DOT6PACK at checkout. The brand new Amazon Echo Dot is shipping right now, and it comes in both black and white to match your home’s decor.